It's not just baseball month in October for Los Angeles but it also seems to be wildlife month. 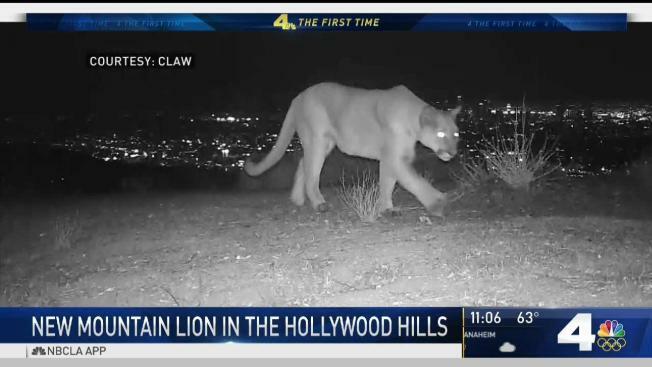 The Citizens for Los Angeles Wildlife were amazed to discover another mountain lion roaming the Hollywood Hills in a recent photograph. "Perhaps we have the bigfoot of mountain lions," Tony Tucci, Co-Director of CLAW, said. "Perhaps." The organization captured the stunning photograph of the newly-discovered puma just after midnight on Oct. 26 in the urban city's backyard. The large cat has no markings or indication of tracking. "We just put the camera up to have a little fun and to verify that there is a lot of wildlife up here," Tucci said. Click here for more of the organization's wildlife photos. After their discovery, CLAW hopes to study the animal and are aiming to purchase the same tract of land that the new mountain lion was seen on. Their "Buy a Mountain" program has raised nearly all the funds needed to claim 17 acres of land in Laurel Canyon to preserve it as an open space. "It's a perfect LA photo with the mountain lion in the city limits," Kate Kuykendall of the National Parks Service said. "The only animal during the course of our study who is east of the 405 is P-22." P-22 is one of LA's most recognized cougars as it famously crossed multiple freeways from the Santa Monica mountains to settle comfortably in Griffith Park. "We are extremely interested to learn more about this animal and how they are able to navigate through relatively developed parts of the mountains," Kuykendall said. Although the National Parks Service is not typically invested in the love lives of Los Angeles' pumas, experts have acknowledged that P-22 has been living life as a bachelor since he is the only mountain lion in Griffith Park. Since the newly-discovered mountain lion's gender is unknown, Kuykendall said she thinks it would be nice if P-22 finally found his mate.